An image of the Ohio Statehouse. In the foreground stands the McKinley Monument, designed by H.A. MacNeil, erected in 1906 and honoring honors William McKinley, former Ohio governor and U.S. president. The Greek Revival building was constructed between 1839 and 1961. The Ohio Statehouse, located in Columbus and serving as the Ohio state capitol, is a National Historic Landmark. This image Capitolshots Photography, ALL RIGHTS RESERVED. Columbus — Calling all teachers! 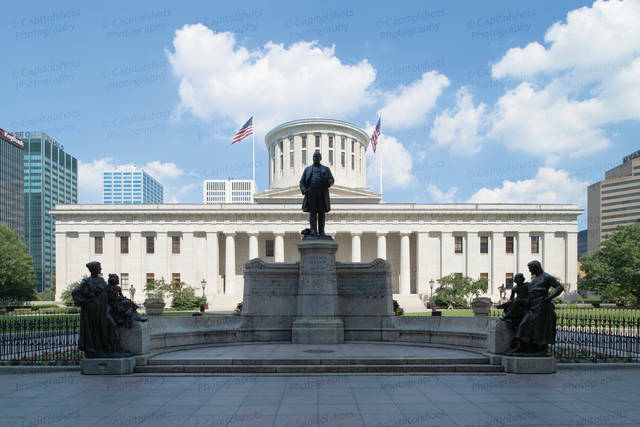 Would you like to know more about the educational opportunities the Ohio Statehouse can provide you and your classroom? Stop by the Statehouse Saturday, September 16, 2017 from noon to 3 p.m., to find out all Capitol Square has to offer! During this informal open house, staff from the Capitol Square Review and Advisory Board (CSRAB) and partnering organizations will provide materials, information, and short presentations about their educational resources available to you and your students. Educators will have the opportunity to learn about tours, digital resources, lesson plans, programs, and more. Don’t want to miss weekend time with your family? They’re welcome, too! There are many family-friendly activities available at the Statehouse on the weekends, including public tours, scavenger hunts, special exhibitions, and a hands-on museum. The Ohio Statehouse is free to visit, and on-site parking is available in the Statehouse parking garage, weekend rates apply. If you plan to attend the Educator Open House at the Ohio Statehouse, please RSVP to Dayna Jalkanen at djalkanen@ohiostatehouse.org or 614-728-2697 by September 13, 2017.
https://www.sunburynews.com/wp-content/uploads/sites/48/2017/09/web1_Ohio-Statehouse-1001.jpgAn image of the Ohio Statehouse. In the foreground stands the McKinley Monument, designed by H.A. MacNeil, erected in 1906 and honoring honors William McKinley, former Ohio governor and U.S. president. The Greek Revival building was constructed between 1839 and 1961. The Ohio Statehouse, located in Columbus and serving as the Ohio state capitol, is a National Historic Landmark. This image Capitolshots Photography, ALL RIGHTS RESERVED.